When it comes time to buy a spectrophotometer it’s important to buy the right spectrophotometer. Nothing will make you feel worse than buying an instrument and then finding out that it doesn’t meet your customers’ requirements, or doesn’t provide you all of the information you need internally. In many cases you will not have a choice; your customer or supplier, or an ASTM or ISO specification will tell you what you need to buy. 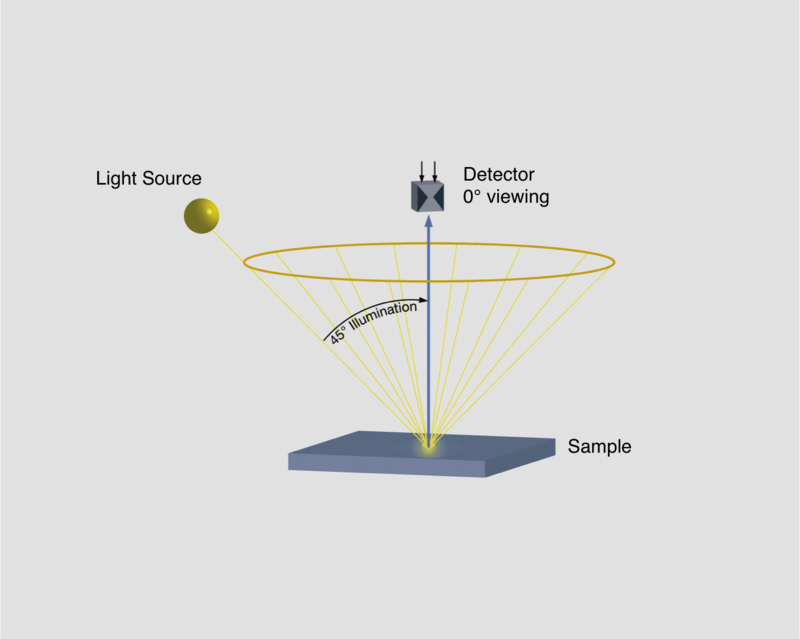 BYK-Gardner offers two geometry choices in the hand-held spectro-guide spectrophotometer, a 45/0 configuration and a d/8 spin sphere geometry. They also offer “S” versions of each. This paper will discuss where each is used and what the measurement differences are between them. The 45/0 geometry has long been considered the workhorse of the QC world. It measures both the color and appearance of the sample vs. the standard, so that any difference in delta e (total color difference) would indicate that the sample does not match the standard. This results in a failure and need to modify the sample/ batch. The problem is that even though it tells you that there is a failure, it doesn’t readily tell you what is causing the failure. What does that mean? Well, the 45/0 instrument shines light on the sample at an angle of 45° and measures at the detector angle of straight vertical (0°). However, not all of the light shining on the sample makes it back to the detector. 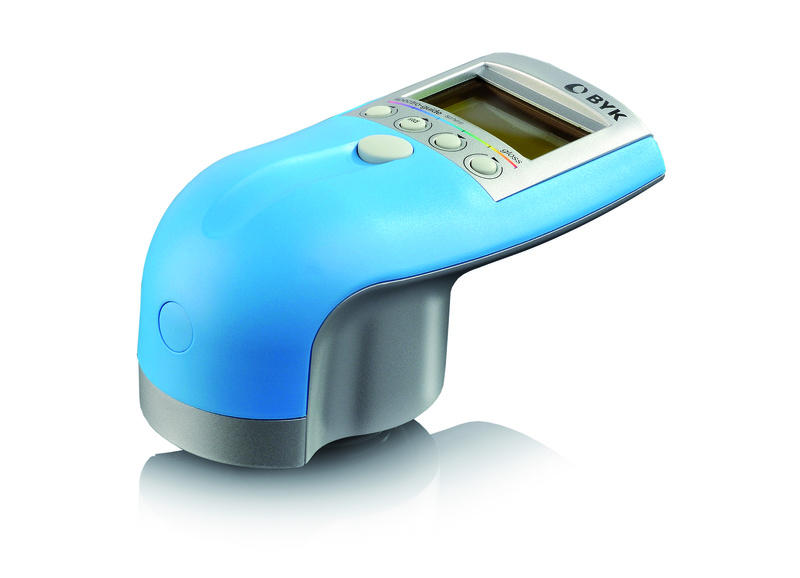 Gloss plays a huge part in the color measurement when using a 45/0 instrument. The glossier the sample is, the more of the light bouncing off of the sample will bounce off at that same 45° or at least somewhere between that specular angle and the 0° detector. This reflected light that is not measured by the detector will result in a lowering of the L value in the color measurement. The “true” color lightness may be exactly the same between sample and standard, but the apparent color lightness will be detected and reported. There is a problem, and that issue can be partly resolved by looking at the gloss difference between the sample and standard. But adjusting the gloss to a zero difference may still show a color difference, which will then have to be addressed. Because the spectro-guide contains both a spectrophotometer and a glossmeter, the two results are displayed simultaneously and it is very quick and easy to determine if the sample has an identical appearance when compared to the standard, and also as to whether the difference is being caused by color, gloss or both. This makes the spectro-guide an even better workhorse solution for the typical QC lab. It gives all the color and gloss information needed to pass or fail a product. 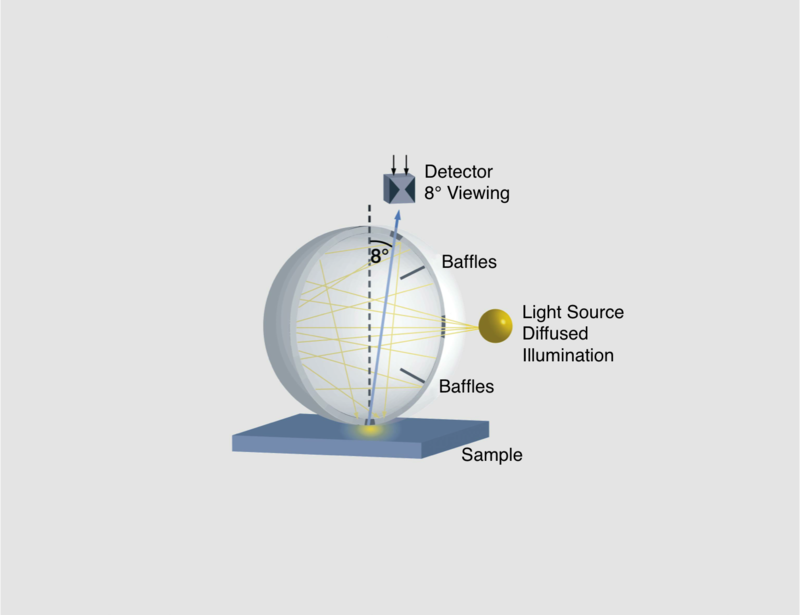 The d/8 spin (specular included) sphere instrument takes you one step closer to finding a difference between the sample and standard. All of the light bouncing off of the sample bounces around in the sphere and is sent back to the detector. This means that the true color differences between the sample and standard are being detected and reported. However, the sample may still not have the same “appearance” as the standard. Again, this is where the spectro-guide line of instruments has its big advantage. If the color difference is essentially zero the instrument can still fail a sample in a QC test if the gloss is outside the specifications stored in the instrument. So it is still measuring the appearance of the sample to the standard, but dividing up the appearance into two true measurements. In general terms, the 45/0 geometry instruments have been used as a QC tool to detect any and all appearance differences. d/8 spin sphere instruments have been used to match color. But with the addition of gloss measurement and inclusion of the gloss specification in the spectro-guide instruments, both the 45/0 and the d/8 sphere instruments make exceptionally good QC tools too. And finally, the explanation of the “S” versions of both instruments will be delved into. The glossmeter included in the spectro-guide measurement port measures 60° gloss values. This angle is good for a wide range of gloss values, from about 10 GU (Gloss Units) up to 70 GU. However, some customers are measuring samples where the average gloss value is much lower than the 10 GU normal measurement range. 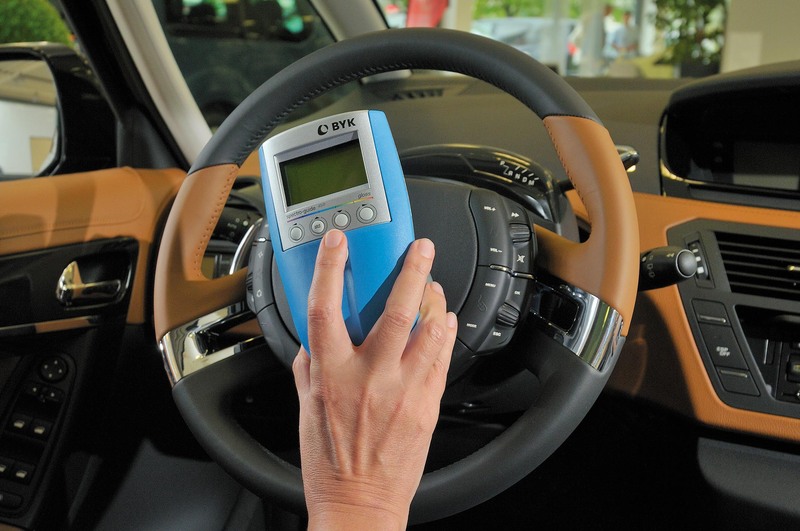 For these customers BYK-Gardner has introduced the “S” units which have a Repeatability in the under 10 GU range of ± 0.1 GU (vs. ± 0.2 GU of the standard spectro-guide) and a Reproducibility between instruments of ± 0.5 GU (vs. ± 1.0 GU of the standard spectro-photometers. All of the above features should be considered when purchasing a spectro-guide. However, the one feature that was not mention is that you really need to find out what your customer or supplier is using to measure the material you supply or that he supplies to you. For example, if he is supplying you material measured on a typical 45/0 instrument and supplying you his numbers, your numbers won’t be anywhere close to his if you have the d/8 sphere instrument. Also, there are some spectrophotometers in the market that measure d/8 spex sphere instead of spin sphere. A d/8 spex measures much like a 45/0 instrument. The light that bounces off of the sample at the specular angle (in this case 8°) is excluded from the measurement (spex = specular excluded). If your customer/ supplier is using a spex instrument you should use the 45/0 spectro-guide to get similar numbers, even if he says that he is using a d/8 sphere geometry. Other factors to consider in buying your spectrophotometer are the type of material that you are measuring, the surrounding environmental conditions, and the typical end-user of the instrument. For example, polished metals often have color standards. However, if you try to measure them with a 45/0 instrument they will reflect nearly all of the light off at a 45° angle and the measurement will appear nearly black. A sphere instrument has to be used with metal surfaces. However, the sphere can have much higher maintenance costs if used in a dusty atmosphere, or in the presence of strong chemicals. The barium coating in the sphere can get dirty or yellow, resulting in the need for a new sphere or a sphere re-coating. The 45/0 instrument, under these same conditions, simply would need a quick blow-out with a can of compressed air. Once the dust is removed from the LED’s and lenses the instrument should read well again. Unless your budget allows for frequent returns for cleaning and calibration, a 45/0 instrument should be used whenever environmental conditions are not perfect, if at all possible. In summary, research or ask which instrument will fill your requirements the best. Consult with your customers, suppliers and other specifiers. Both instruments will give good accurate repeatable results. But good, accurate results may not be the right results if they’re not measured using the correct geometry.